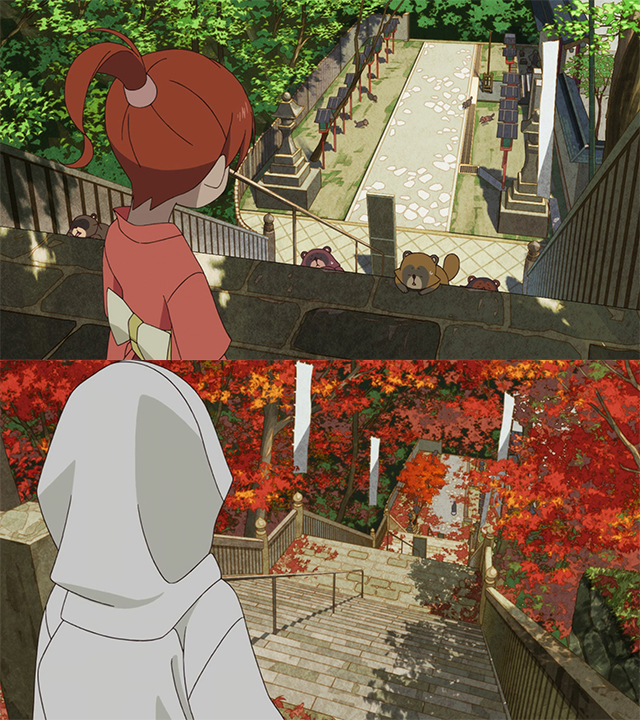 Uchouten Kazoku enamored all viewers it could reach, but not many people would have bet on it receiving a sequel. Sometimes good things do happen though, and so this delightful family series set in a magical Kyoto is back. Masayuki Yoshihara’s take on Tomihiko Morimi’s novels is thoughtful and immensely rich in detail, so we’re going to have plenty of neat moments to highlight. And as usual, expect a look at the staff as well. Expect these posts every 1-2 weeks, depending on how this season fares. Enjoy! — This sequel existing is a bit of a miracle. Perhaps a lot of a miracle. 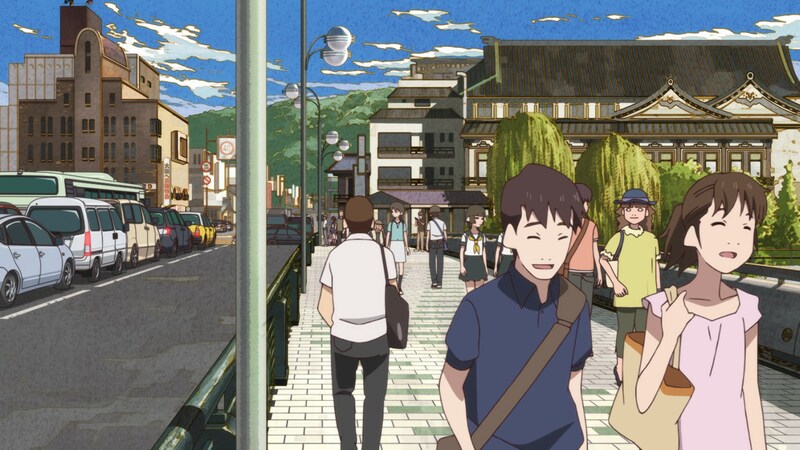 It didn’t come out of nowhere, though; while TV anime being stuck in its awkward space means that shows like this will never properly reach the audience that would love them, Uchouten Kazoku still garnered a passionate small fanbase. 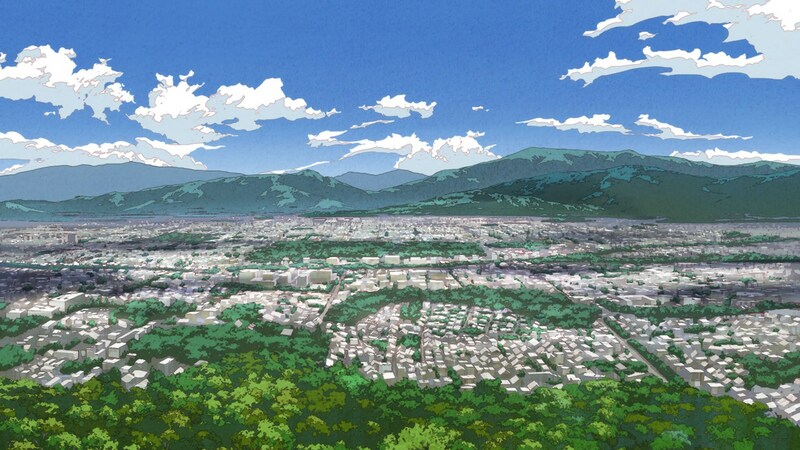 That, alongside with its endurance thanks to collaborations with the city of Kyoto itself, somehow managed to justify this second series. And even if that weren’t the case, we might have been given this gift either way simply due to how much its staff cares. 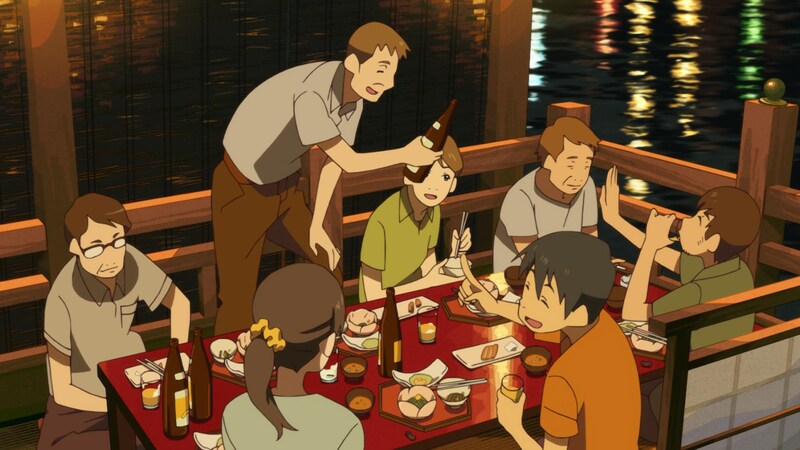 Uchouten Kazoku remains the one major title directed by their cofounder and star director Masayuki Yoshihara, as well as the exception where the studio actually leads the production committee. Not content with that, the sequel credits P.A. Works president Kenji Horikawa as the sole planning person, replacing Bandai Visual’s Akio Maeda from the first season. 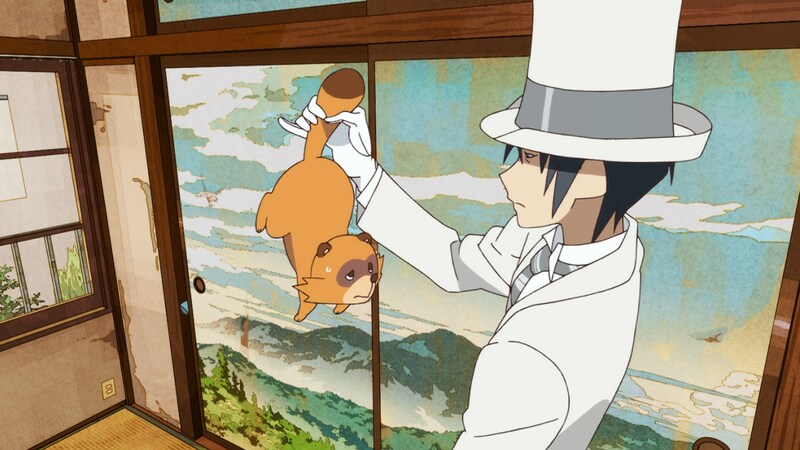 Despite overlapping with an original series by the studio, something that tends to get the highest priority by default, it’s Uchouten that will seemingly receive the best treatment. Don’t take this as criticism of other titles – how could I do that when some of my favorite franchises exist to sell plastic to children – but in an industry so preoccupied with safe financial moves, it’s delightful to see the very definition of a passion project. — The introduction of the original series was nothing short of perfection. 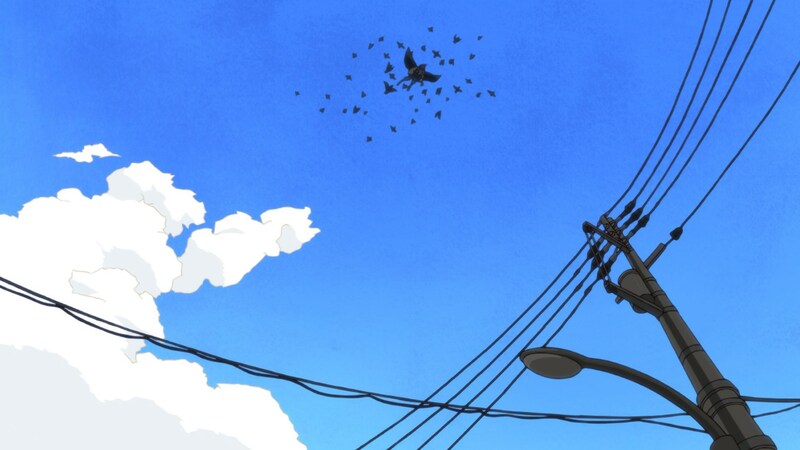 Within the minute and a half before the opening sequence began for the first time, it introduced Tomihiko Morimi’s bustling Kyoto, its power dynamics, and even its protagonist; the busy crowds roaming the lively city, the contrast between the proud tengu in the sky and the creatures than inhabit the ground, Yasaburou’s whimsical life, all of it was perfectly encapsulated within that sequence. A directional feat, plus an excellent piece of animation as well. Was the intro to the sequel equally impressive, then? Not really, no. Parts of it bring to mind the dynamism from the original, but it’s otherwise much more reserved…a comment that stands true for the episode as a whole. 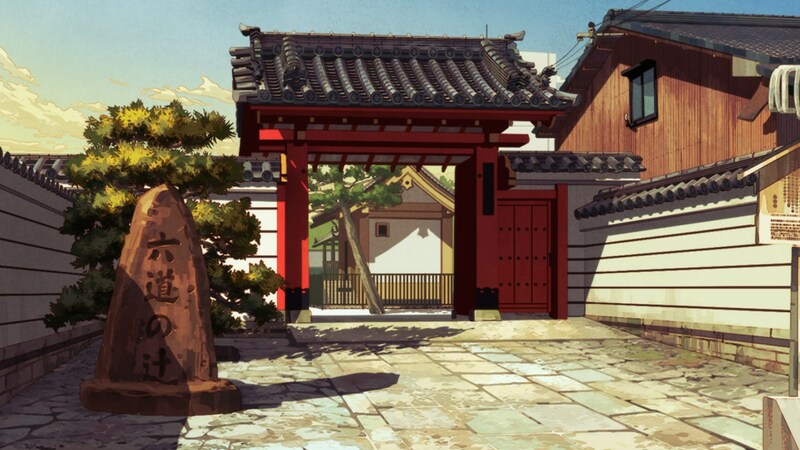 We’re treated to some nice layouts depicting moments like their mother Tousen having quite literally climbed the stairs to adulthood and revisit old perspectives, but besides the smart construction and density of the setting it’s not a brilliant production effort. This episode would have comfortably fit within the first season, but didn’t really approach its peaks – and that’s perfectly fine! Unlike the beginning of season 1 which had to win over the viewers, all this episode needed to offer was a warm reintroduction to the family we had come to love. The cast’s chemistry is as strong as ever, so I’m perfectly fine waiting for more climactic moments to receive better treatment. As long as this isn’t a sign that the sequel will generally trend downwards, this is perfectly fine. — Despite the name of the series, there’s nothing eccentric about Yoshihara’s work. 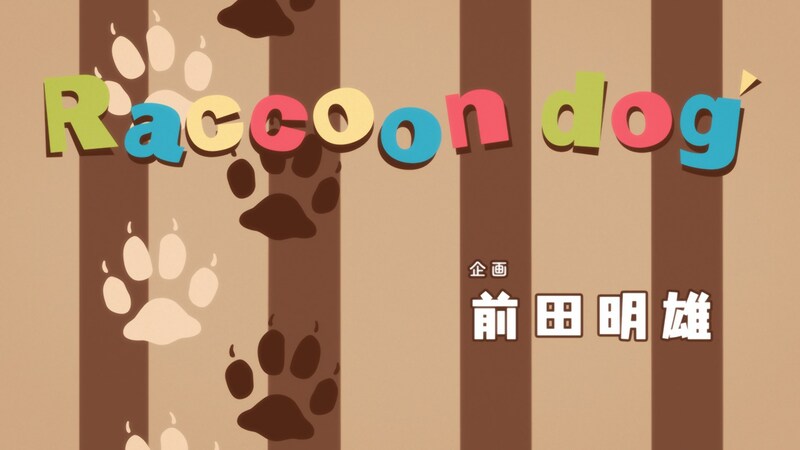 He’s notoriously thorough, possessing the kind of vision to plan all scenes with excruciating detail; when an upside-down tanuki-turned-umbrella reverts back to human form, he maintains his position. 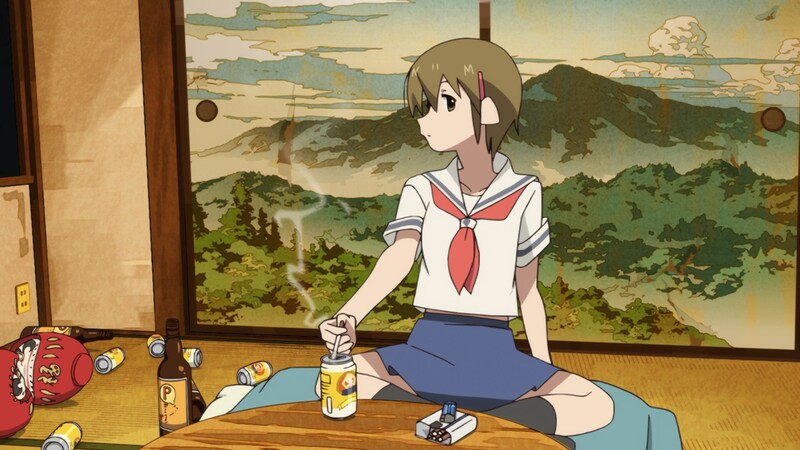 Back in the very first episode of the series, there was a long sequence where the protagonist was cleaning up a room, picking up all cans…then deciding to leave one back. Minutes later, we see that’s because he wanted to use it as an ashtray. 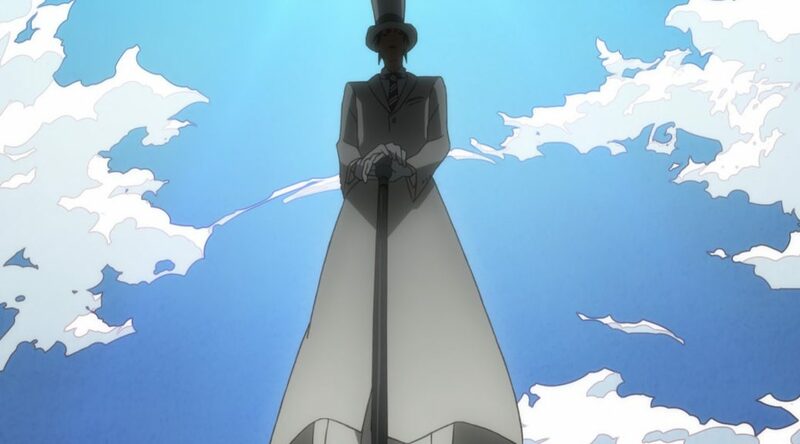 Another scene in the first episode immediately reminded me of this; for quite a while we see some cloth poking from a closet, while the new character (who possibly notices it) interrogates Yasaburou about his master as he pretends to know nothing. 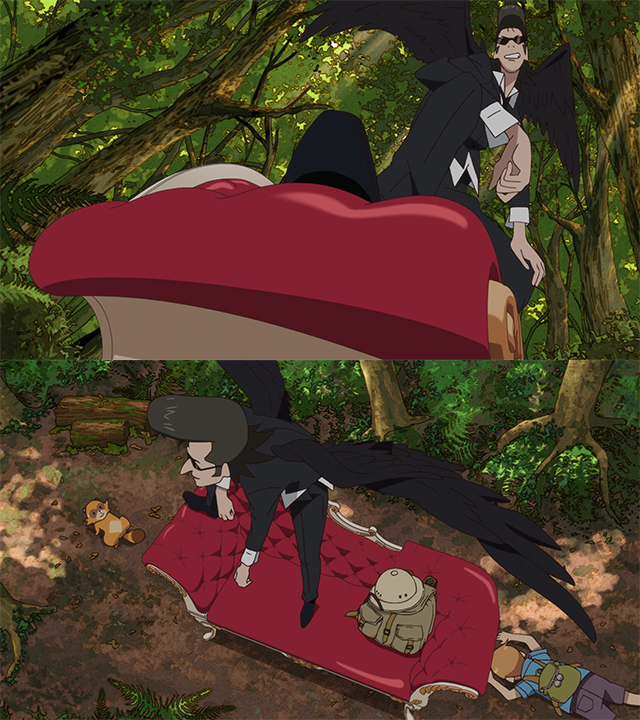 After quite a while, it’s revealed that he had hastily hidden the real tengu in there. And let’s not forget the grandma that gets absorved into the dumb twins’ dancing routine, then later feels the strain on her neck. 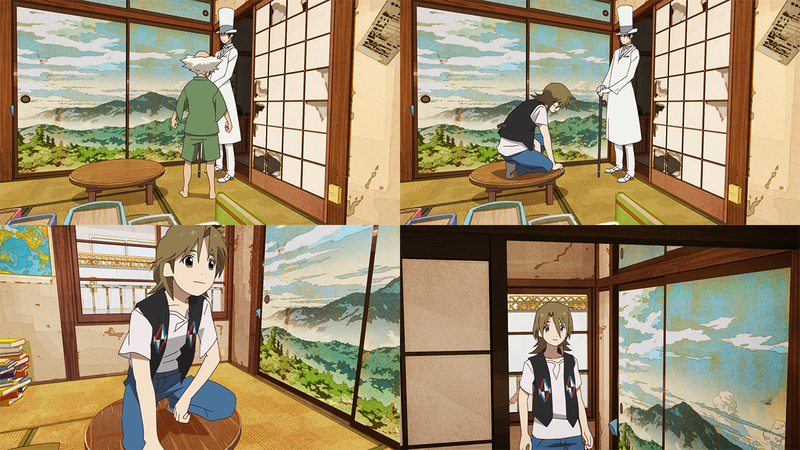 I feel like scenes like this embody Yoshihara’s down to earth approach. His studio lacks the animation power to consistently articulate nuanced character acting, and while his layouts can be rather flashy, he doesn’t have the flair of some well-known anime directors. And yet, his obsessive thoroughness still gives this series way more character than the vast majority of anime. Yoshihara is at the opposite end of unpredictable genius directors, instead standing out as a very methodic creator. Mind you, this still isn’t an ideal situation – which is why the show was at its best when accompanied by unusually strong craft in other aspects – but it’s commendable how much he can carry through his thoughtful storyboards alone. — Everyone’s eyes will be on Yoshihara’s unsurprisingly effective storyboard, but I would like to draw some attention to the episode director Yasuo Fujii – it was his debut after all! Fujii is an animator whose entire career has been tied to P.A. 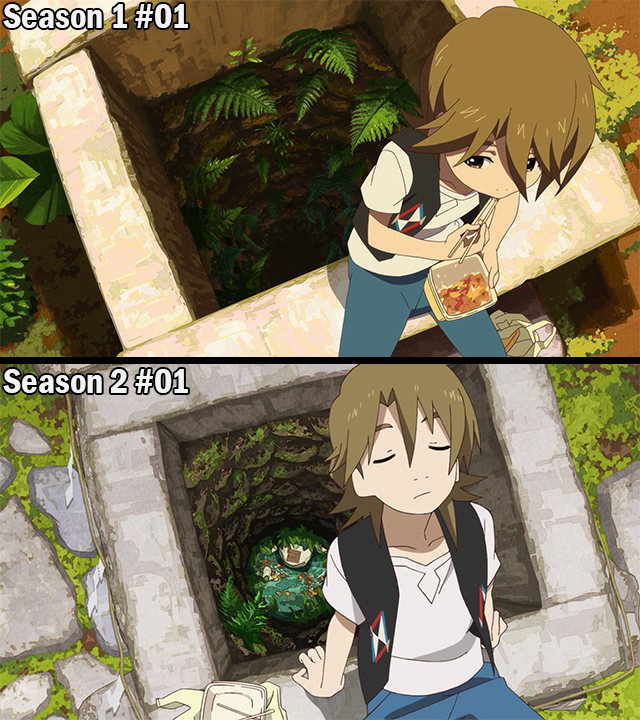 Works, going from in-betweening (and some rare instances of painting) to a recurring key animator. 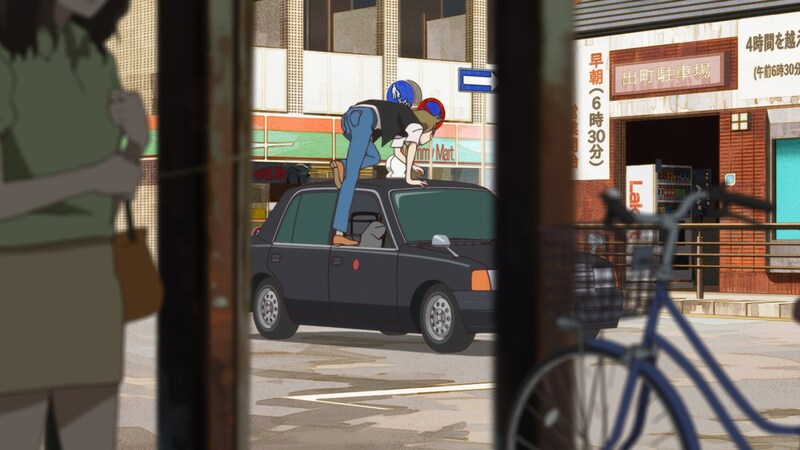 By the time the first series of Uchouten Kazoku was produced, he had gained the studio’s trust to the point of becoming a regular prop designer. As a result of that he worked rather thoroughly on season 1, so it’s heartwarming to see him make his debut on the sequel. And judging by the result, he did a more than acceptable job…though I have to admit that working with a Yoshihara storyboard and under his series direction is likely as comfortable as this job gets. Either way, congratulations to him for his debut! He has abandoned his prop design duties, so chances are that directional work is keeping him busy this time. We’ll see how his future episodes shape up. — Quick note on the key animators and their work in this episode. For starters, it’s quite nice to have another series animated by a small group of people after Maidragon’s end. Usually the state of credit lists when a show starts and when it ends is worlds apart, but since the first series managed to keep things fairly stable, I’m willing to trust the sequel as well. It’s all P.A. Works people for now, mostly staff who had already worked on the first season – though some have been promoted since then, as they were still drawing in-betweens at that point. The animation itself was thoroughly decent, far from anything I would celebrate but at least sporting a couple of short neat highlights. This will hardly be a series full of intricate movement, though I will keep on praying for Toshiyuki Inoue’s return. 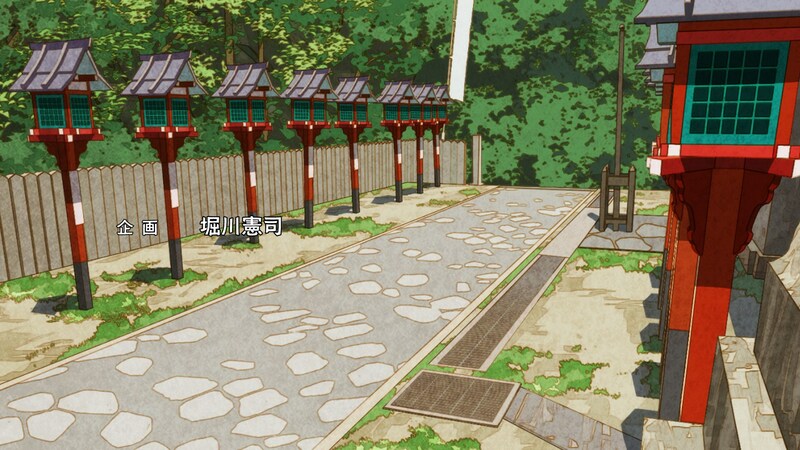 — I don’t want to talk at length about this show’s depiction of Kyoto quite yet, but I’m contractually obliged to at least point out that I had missed these backgrounds. I actually liked this episode better than the first season taken as a whole. Damn was it tight, visually and narratively. Agreed with you that this first episode of 2nd season fit right in with the first season, yet lack the sparks to stand out. But its attention to details is excellent. I loved it but yeah, I don’t think that by itself it’s one of the truly special episodes of Uchouten. But Yoshihara’s thoroughness really is impressive nonetheless, and just seeing the cast again almost brings a tear to my eye. I missed this show.